A tanker flipped over and caught fire just now on the northbound lanes of the Gulf Freeway in Houston, according to the local ABC affiliate. At least one person was reportedly killed. 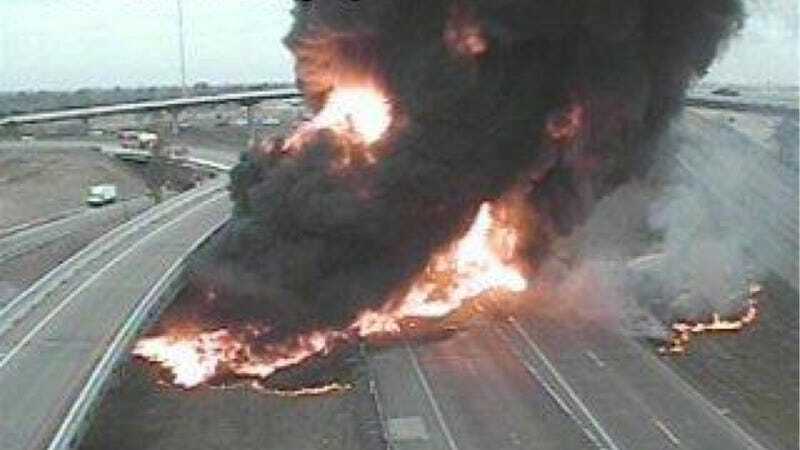 From the looks of this picture from a Houston traffic camera, it looks like the conflagration has mostly been put out by now. UPDATE: Four vehicles were involved in the incident, according to the Greater Houston Transportation and Emergency Management Center. There is no word on injuries as of this writing. UPDATE #2: At least one person was killed, according to KHOU reporter Bill Bishop. No further information has been released yet as to the identity of the deceased or their role in the accident. UPDATE #3: The lone fatality was the driver of the truck, according to a Houston Fire Department spokesman. Nobody else was injured.